GLORY 22 takes place Friday in Lille, France and features a World Heavyweight Championship fight plus a four-man Lightweight Contender Tournament and an explosive co-main event between two hard-hitting light-heavyweights. The Glory Superfight Series for Glory 22 will be exclusively available online, via a pay-per-view (PPV) live stream. The stream costs $9.99 and will be available live with a fight time of 1:30 pm ET. The show is geo-blocked in ex-Yugoslavia, but will be available to fans in the US. Our partners Eversport are taking care for the live stream. 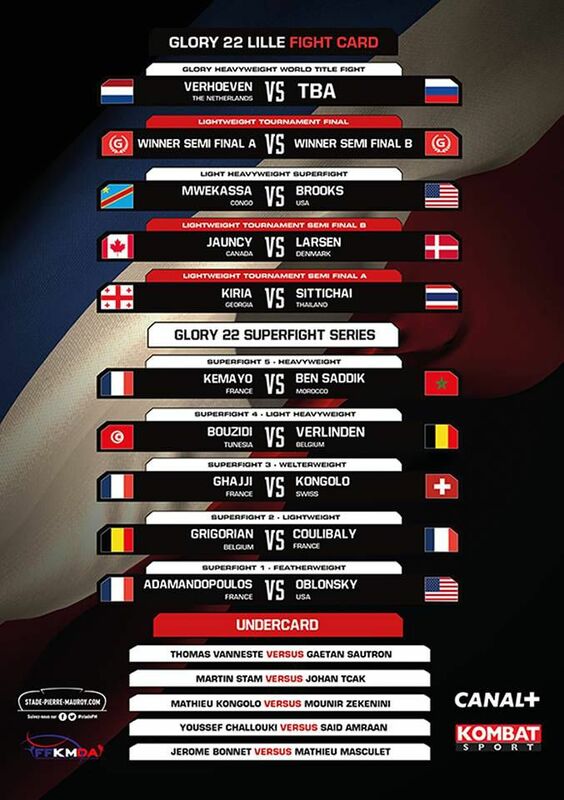 Follow the link and watch the live stream at: http://eversport.tv/fight-sports/glory-world-series/2015/6/6/glory-22-superfight-series. The GLORY heavyweight champion will face Benny Adegbuyi at GLORY 22 tonight, June 5, 2015. “The Prince” opened up about life lessons, being focused and fighting close to his home in the Netherlands for the first time in several years. Verhoeven has an opportunity to join the elite club in the young kickboxing promotion. With a win over Benjamin Adegbuyi, he will be the only champion on the roster to have defended his belt twice.